This cover went into the mail in Wellington, New Zealand. I'm not sure of the date but there are several covers around this date associated with this maritime disaster. The cover is salvaged from a shipwreck at sea on August 18. I have saved the notes describing the original item and will just use them (with minor editing). "Wellington, New Zealand (from enclosures) to New York, N.Y. 1930. Partial black dl CDS containing letters "RTH" as the ending and "N.Z." located in the upper right corner adjacent to the outline of a missing red stamp. Magenta three line "Salvaged from | S.S. Tahiti | Lost at sea" hand-stamped in the lower left corner. Magenta dl "SAN FRANCISCO CALIF. P.O. SEP 1 1930" transit CDS on the back flap. Enclosure is a coupon and typed letter regarding a book on muscular development. Both show the effects of the water. "According to Hopkins (A.E. 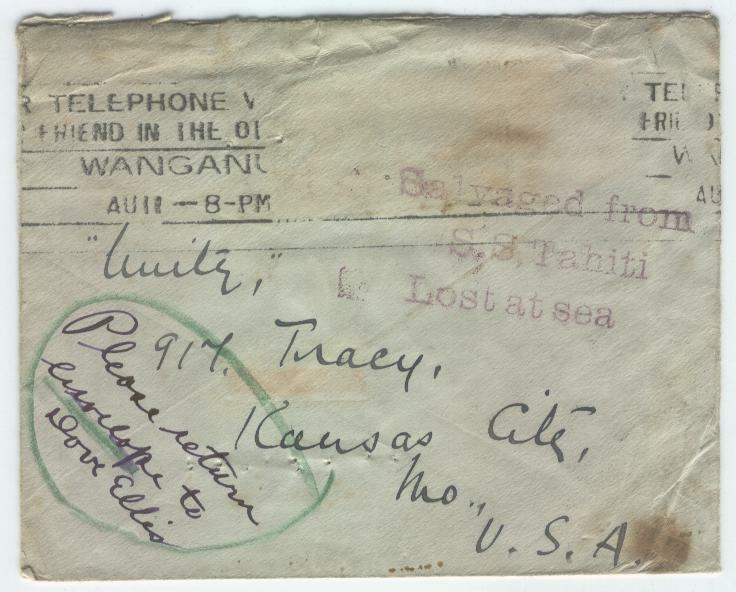 - A History of Wreck Covers) - Mail 'salvaged from the British steamer Tahiti en route from Wellington, New Zealand, to Rarotonga, which vessel was abandoned at 2.28 a.m. on 18th August, 1930, some 460 miles from Rarotonga. She sank at 4.42 p.m. the same day. The passengers and crew were transferred to the steamer Ventura which, together with the Norwegian steamer Penybryn, was standing by to render assistance. The letter mail was transferred to the Ventura with the exception of nine bags which were lost in the sea. Fifty of the bags were wetted by sea water but the remainder was unharmed. 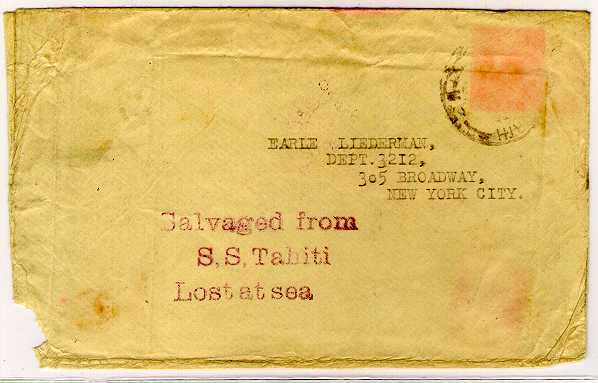 The newspapers, packages and parcels mail (139 bags in all) sank with the ship. . . .
"'The salvaged mails which were destined for the United States received the Salvaged from | S.S. Tahiti | Lost at sea mark, handstruck in the magenta colour which is characteristic of the U.S. Post Office. I have seen two covers so marked. 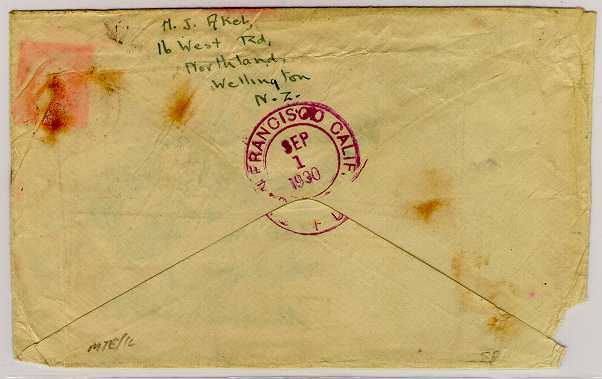 The first is a foolscap envelope addressed to Cleveland, Ohio, which reached its destination on 9th September, 1930. The New Zealand date stamp was washed away with the adhesives. 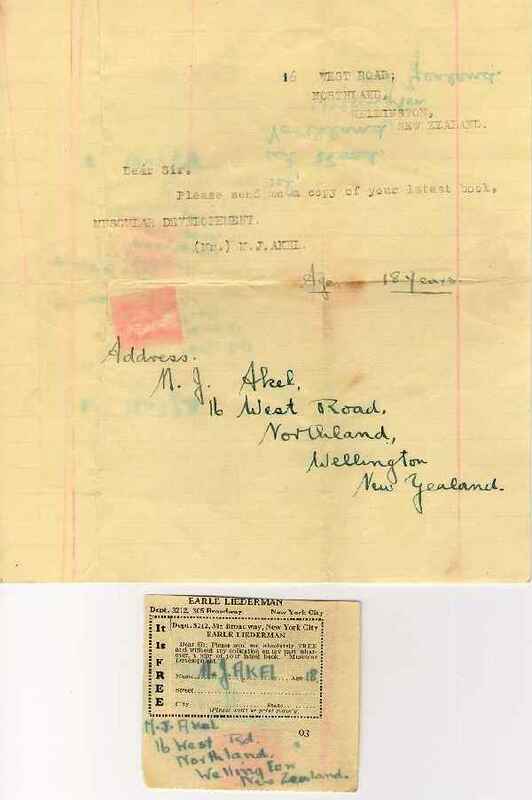 The other is addressed to New York, and the New Zealand date stamp was similarly washed away with the adhesive. There is enough left however to determine that it was posted in Wellington. There is a San Francisco transit mark on the back of SEP 1 1930, and it is probable that the wreck cachet was also struck there, as the colour of the ink is identical.'" Here is the enclosure requesting "your latest book, MUSCULAR DEVELOPMENT:"
The salvaged enclosures even include the sender's coupon clipped from a periodical! Further work by Chip Gleidman reveals this information about the addressee, Earle Liederman. He also found this illustration of the 14th edition of Liederman's Muscular Development. Thanks, Chip for those interesting additions to this intriguing story. "S.S. Tahiti - 7585 gross tons, length 460 ft x beam 55.5 ft (140.21m x 16.92m), one funnel, two masts, twin screw, speed 17 knots. Built with accommodation for 160-1st and 60-2nd class passengers. Built by Alex Stephen & Sons, Glasgow, she was launched as the PORT KINGSTON on 19th Apr. 1904 for Elder Dempster & Co's Imperial Direct West India Mail Service between Avonmouth, Bermuda and Kingston, Jamaica. 'Laid up in 1910 when the service ceased, she was sold to the Union SS Co of New Zealand in 1911, renamed TAHITI and fitted with accommodation for 277-1st, 97-2nd and 141-3rd class passengers. Used on the Sydney - Wellington - Raratonga - Tahiti - San Francisco service. "Chartered to the New Zealand Government in 1914, she was converted to a troopship and trooped mainly to Marseilles and Gallipoli, with three voyages to the UK. In 1918 she trooped between the USA and Europe and then came under the control of the British Transport Service. Used in 1918 for the repatriation of troops to NZ and of British troops from India to the UK, she was then returned to her owners and refitted. Seems like quite a bit of history to me. *Thanks to Ed B. for finding this delightful site with the pictures of the S.S. Tahiti. "I read with interest the page on your stampwhiz.com site regarding the SS Tahiti. Attached is a scan of a Tahiti cover I have. It is addressed to the Unity in Kansas City, MO. My grandfather worked in the mailroom there at the time it came through, 1930. He was not a stamp collector but found it interesting enough to hang on to. Fifty years or so later he gave it to his stamp collecting grandson. I thought you would like to see another example. "My grandfather was not a stamp collector but the cover interested him enough that he kept it for 50 years until he gave it to his stamp collecting grandson. He would be delighted to know that others are interested in the cover he saved." about 150 km north of Wellington and almost 350 km due south of Auckland. the Whanganui National Park and the Whanganui River. Wanganui City rests on the banks of the Whanganui River. The cover has lost the stamp as a result of being soaked in the ocean. There is also the magenta "Salvaged from | S.S. Tahiti | Lost at sea" handstamp. 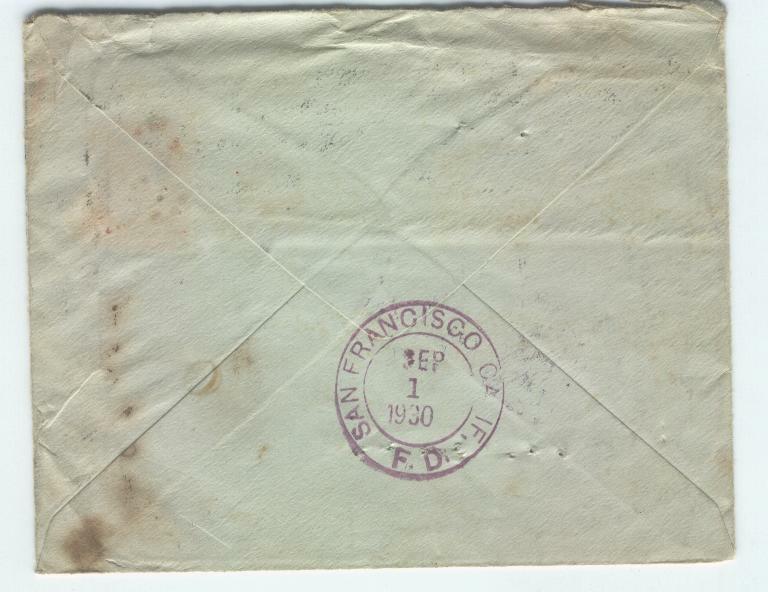 San Francisco Foreign Division where it entered the US mail on the back. probably a mail room friend of Scott Lee's grandfather, Guy O'Hara. It's wonderful for Mr. Ellis and Mr. O'Hara to have saved this interesting piece of postal history. Thanks, too, to Scott for sharing it with us. It is things like this that make writing up these covers worthwhile.